In some ways this project is stating the obvious, but the obvious sometimes needs repeating. As Ushahidi’s former Executive Director Ory Okolloh warned over two years ago: “Don’t get too jazzed up! Ushahidi is only 10% of solution.” My own doctoral research, which included a comparative analysis of Ushahidi’s use in Egypt and the Sudan, demonstrated that training, preparedness, outreach and strategic partnerships were instrumental. So I do appreciate DeadUshahidi’s constructive (and entertaining!) efforts to call attention to this issue and explain what makes a good crowd-sourced map. No one has submitted a report to your map in the last 12 months. For time-bound events, like elections and disasters, the number of reports are so infinitesimally small (in relation to the number of the community the map is targeting) that the map never reached a point anywhere near relevance. (Our measure for elections is, for instance, # of submissions / # of registered voters > .0001). The map was never actually started (no category descriptions, fewer than 10 reports). We call that a stillbirth. Mapping doesn’t equal change, but why assume that every single digital map is launched to create change? Is every blog post written to create change? Is every Wikipedia article edit made to effect change? Every tweet? What was the impact of the last hard copy map you saw? Intention matters and impact cannot be measured without knowing the initial motivations behind a digital map, the intended theory of change and some kind of baseline to measure said change. Also, many digital maps are event-based and thus used for a limited period of time only. They may no longer receive new reports a year after the launch, but this doesn’t make it a “dead” map, simply a completed project. A few may even deserve to go to map heaven—how about a UshahidiHeaven crowdmap? I’m also not entirely convinced by the argument that the number of reports per map has to cross a certain threshold for the crowdsourced map to be successful. A digital map of a neighborhood in Sydney with fewer than one hundred reports could very well have achieved the intended goal of the project. So again, without knowing or being able to reliably discern the motivations behind a digital map, it is rather farfetched to believe that one can assess whether a project was success-ful or not. Maybe most of the maps in the DeadUshahidi cemetery were never meant to live beyond a few days, weeks or months in the first place. That said, I do think that one of the main challenges with Ushahidi/Crowdmap use is that the average number of reports per map is very, very low. Indeed, the vast majority of Crowdmaps are stillborn as a forthcoming study from Internews shows. Perhaps this long-tail effect shouldn’t be a surprise though. The costs of experimenting are zero and the easier the technology gets, the more flowers will bloom—or rather the more seeds become available. Whether these free and open source seeds actually get planted and grow into flowers (let alone lush eco-systems) is another issue and one dependent on a myriad of factors such as the experience of the “gardener”, the quality of the seeds, the timing and season, the conditions of the soil and climate, and the availability of other tools used for planting and cultivation. Or perhaps a better analogy is photography. Thanks to Digital Cameras, we take zillions more pictures than we did just 5 years ago because each click is virtually free. We’re no longer limited to 24 or 36 pictures per roll of film, which first required one to buy said roll and later to pay for it again to be developed. As a result of digital cameras, one could argue that there are now a lot more bad quality (dead) pictures being uploaded everywhere. So what? Big deal. There is also more excellent amateur photography out there as well. What about other technologies and media? There are countless of “dead” Twitter accounts, WordPress blogs, Ning platforms, customized Google Maps, etc. Again, so what? Neogeography is about democratizing map-making and user-generated maps. Naturally, there’s going to be learning and experimentation involved. So my blog post is not written in defense of Ushahidi/Crowdmap but rather in defense of all amateur digital mappers out there who are curious and just want to map whatever the heck they well please. In sum, and to return to the gardening analogy if I may, the more important question here is why the majority of (Usha)seeds aren’t planted or don’t grow, and what can be done about this in a pro-active manner. Is there something wrong with the seed? Do would-be gardeners simply need more gardening manuals? Or do they need more agile micro-tasking and data-mining tools? 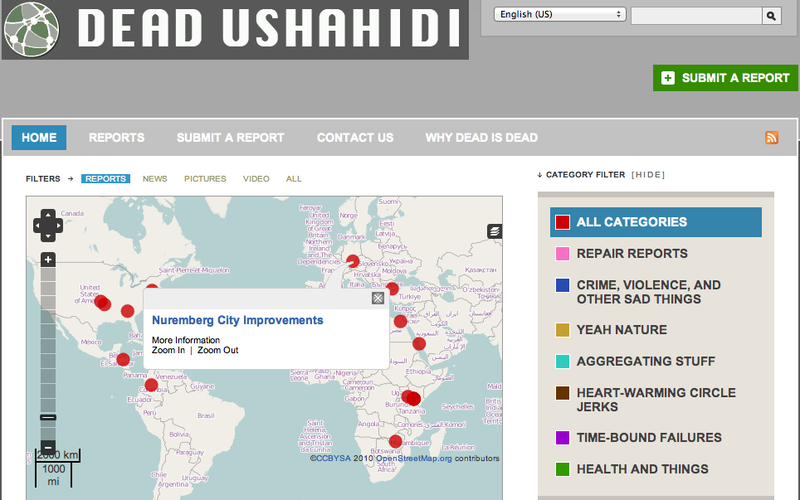 The upcoming Internews report goes a long way to explaining the why & what and TechChange’s course on Ushahidi may be one way to save some future maps from ending up in the DeadUshahidi cemetery prematurely. This entry was posted in Crowdsourcing, Digital Activism, Social Media and tagged DeadUshahidi. Bookmark the permalink. Crowdmap is a [one trusts] better way to illustrate issues right? I suggest a crowdmap about the very issue of the discussion – the wgen/wheer/what of all Ushahidi maps. I suggest Ushahidi maps is a good way to illustrate the “cloud” of live, new,and zombie crowdmaps to help migrate this discussion into the “empowered” present—Ushahidi must be used to describe Ushahidi, musn’t it?